HCT Trustee Colin Leonard refurbishes the boardwalk & bench. L-to-R: HCT volunteers Bill Gordon and Colin Leonard get ready to replace decking. Back in 1998, Harwich Conservation Trust (HCT) and AmeriCorps partnered to establish HCT’s first wheelchair accessible boardwalk at the A. Janet DeFulvio Wildlife Sanctuary, approx. 12 acres in West Harwich off Rt. 28 donated to HCT by the DeFulvio and Eizenberg families in 1994. 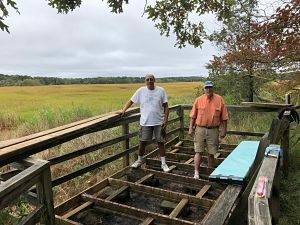 The meandering boardwalk leads to a viewing deck and bench overlooking the Herring River marsh and an osprey nesting platform. Over the last two decades, salt water and weather have led to structural issues. 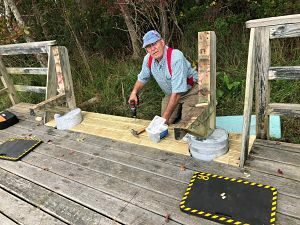 In early October, HCT volunteers Patrick Otton, Patrick Dooley, Bill Gordon, and Colin Leonard (also a HCT Trustee) renovated the deck and bench so visitors can better enjoy the scenic setting. Businesses donated all of the building materials and supplies including Mid-Cape Home Centers, Harwich Paint & Decorating, Northeast Tool & Supply, and Meservey’s Shell Gas Station on Rt. 137 in East Harwich. The Town Highway Department hauled away the construction debris. 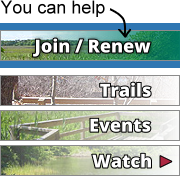 Click “Trails” above and find the link for the A. Janet DeFulvio Wildlife Sanctuary Boardwalk to see a trail map.